The January 1994 Northridge earthquake caused loss of life, injured thousands and resulted in over $20 billion in damage. In addition, the quake caused $3 billion in damage to hospitals, with twelve hospital buildings deemed unsafe for occupancy. In 1995 the State of California passed Senate Bill 1953 mandating seismic retrofit of hospitals throughout the state, including 2,500 buildings on 475 hospital campuses. 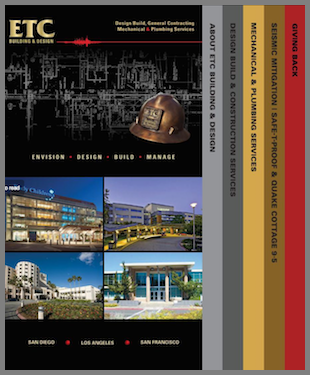 ETC has extensive SB1953 design and construction experience. As experts in the field, we’ve had frequent in-depth discussions on SB1953 requirements with the legislators, policy makers, and the authority that will ultimately enforce the regulations – OSHPD. In order for health care facility owners to make informed decisions about their overall campus-building program, it is important to have an understanding of the current legislation as well as proposed future legislation. ETC can provide comprehensive code and cost consulting services so that you can understand the best course of action to take in regard to the seismic safety required by law for your facilities and campuses. Having provided budgets for over 30 hospital campuses on SB1953-required work, ETC also has extensive cost consulting experience and can accurately estimate program costs based on our historical cost database and market conditions. Since its passage in 1995, SB1953 has been amended to provide relief to the deadlines for those facilities that meet the revised requirements. ETC is ready to assist you with meeting the revised compliance schedule for your health care facilities. ETC’s Design-Build process integrates budgeting, design, construction and full accountability for your project in one efficient point of contact: ETC. Sourcing design and construction with one expert vendor gives you the highest assurance of a project that meets your functional requirements, is practical to build, can be finished expeditiously and avoids costly change orders. Typically, using design/build will get your project completed more quickly, with better quality and lower costs than working with multiple contractors. In the pre-construction phase, ETC will provide structural engineering and design documents, estimating, scheduling, cost/schedule studies, early cost guarantees and expediting of OSHPD permitting. Upon project approval ETC will begin construction, working closely with you throughout the project to meet your budget and schedule. We’ll help you ensure the most cost effective implementation of your seismic retrofit to comply with SB1953.